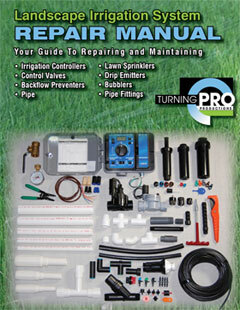 This repair manual will guide you through the process of trouble shooting your sprinkler system, drip emitter and bubbler irrigation system when problems arise. Learn how to diagnose problems encountered in most existing landscape irrigation systems. Locate and repair leaks in piping, replace existing valves, sprinkler heads and faulty equipment easily and correctly. Eliminate recurring problems with controllers, wiring, sprinkler heads, pipe and emitters. Common repairs are simply illustrated, from leaking pipes to valve replacement to fine tuning the efficiency of you irrigation controller. Most problems can be fixed with basic tools and inexpensive replacement parts. It is written and illustrated to provide simple and easy step by step procedures for anyone to understand. This manual was created by two landscape professionals, a landscape contractor, Keith Hageman with over 35 years in the field of landscape construction and a landscape architect, Patrick C. Morse with over 28 years of experience in landscape design. Together they have designed and constructed all types of sprinkler irrigation systems, drip emitter systems and bubbler systems. Almost all landscape watering systems have the same basic components and equipment. Therefore, almost all systems will have the same repair issues during its lifetime use. Knowing what to look for in repairing and replacing parts can save time and money. Some repairs may be as simple as turning on the power to the controller, flipping a circuit breaker or turning on the water source that was mistakenly shut off. Although most repairs are simple and require little time, some may require excavation and removal of existing equipment. Over the life of an irrigation system most of the equipment and components will need to be replaced or repaired. This manual will help you diagnose the problems that arise as equipment and parts fail or wear out and show you the steps to successfully resolve them. By keeping your sprinkler, drip emitter or bubbler system in good repair it will be more water efficient, reliable and last for many years. Full color, pictorial guide, 188 pages. Available as printed book, or as eBook (PDF format).